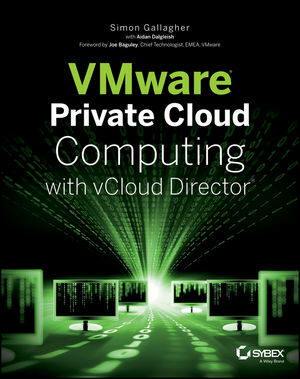 I was recently given the opportunity to contribute to the book VMware Private Cloud Computing with vCloud Director, being written by Simon Gallagher. Simon invested a great deal of time writing the book from the perspective of an end-user, incorporating the lessons he learned from his experience whilst working for VMware and Colt, and trying to cover many day-to-day usage topics. I can only take credit for a fraction of the work, acting as the Technical Editor and writing two chapters, leaving Simon to do all the ‘heavy lifting’. Empowered by virtualization, companies are not just moving into the cloud, they’re moving into private clouds for greater security, flexibility, and cost savings. However, this move involves more than just infrastructure. It also represents a different business model and a new way to provide services. In this detailed book, VMware vExpert Simon Gallagher makes sense of private cloud computing for IT administrators. From basic cloud theory and strategies for adoption to practical implementation, he covers all the issues. You’ll learn how to build a private cloud and deliver it as a service using VMware vCloud Director 5.1.